Multi-Clamp® System by Hydro-craft enables you to route single line runs, multiple runs of the same line diameters, or multiple runs of various diameters. Multiple line runs can be stacked to conserve space and make installations more rigid. Center line dimensions between all lines remain the same, both horizontal and vertical, when Multi-Clamps are stacked. 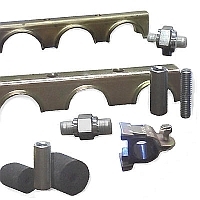 Clamping units may be cut to length.